Poop Swoop Wipes have been specifically manufactured to be a bird safe.......quick and easy clean up product. I just love these Poop Swoop Wipes. 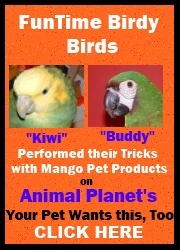 I always use them to clean all my feathered children's bird cages. They really help to take the poop right off the cage grates and any other areas on their cages that might have food or poop stuck on them. The best thing about the Poop Swoop Wipes is that they are non-toxic and biodegradable. Each Poop Swoop Wipe container includes 40 - 7" x 8" wipes. A&E - PlayTop Cage - 36" x 28"
Poop Swoop Wipes by Mango Pet Products3SusanJune 11, 2015They weren't as damp as some of the other brands I've purchased. It's nice to have a product to wipe up poop and food without using as many paper towels. Poop Swoop Wipes by Mango Pet Products5CindiFebruary 14, 2014These really do work and make cleaning perches, grate trays and cage bars a snap! I can clean these pieces with one wipe versus multiple paper towels I was using previously! Poop Swoop Wipes by Mango Pet Products5Gail PiperApril 7, 2013These really do clean up the poop--even dried up poop--very easily. What bird owner doesn't need help with that little chore, eh?